Carefully selected logic riddles and mind puzzles. Test your brain. You are standing next to three switches. You know these switches belong to three bulbs in a room behind a closed door – the door is tight closed, and heavy which means that it’s absolutely impossible to see if any bulb is on or not. All three switches are now in position off. You can do whatever you want with the switches and when you are finished you open the door and go into the room. While in there you have to tell which switch belongs to which bulb. Which direction is the bus going, left or right? 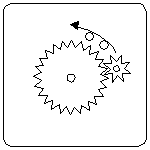 There are two cogwheels in a box. The bigger one has 24 teeth and it is tightly attached to the center of the box (it doesn’t turn or move). The smaller one has 8 teeth and it rotates around the bigger wheel. How many times does the smaller wheel turn compared with the box when it turns once around the bigger wheel? Participants shoot in given order until only one survives. Everyone shoots only once when it’s his turn. If someone is injured the others finish him off with iron rod. The worst shooter (you) shoots first the best shoots last. Poor farmer went to the farmers market to sell his corn. He had only one sack so he put barley into one half of the sack tied it in the middle and filled the other half with wheat. He found a buyer at the market who unfortunately wanted only barley which was at the bottom. The buyer had also only one sack and he didn’t want to switch sacks as his one was bigger. How did they get the barley from one sack to the other without pouring the grain somewhere else? Man comes home and what does he see? Mother-in-law came over. I don’t know how but they started a fight. About what is not important at all. Mother-in-law: You just lie all the time. Mother-in-law: You don’t tell a sentence without lying! Mother-in-law: Let’s try it: tell me one true sentence. Man: Ok but you will get out after. Mother-in-law: If you tell me true sentence I’ll go but if you will lie again I will stay. I promise I will! Man thought for a while and than told her one sentence. Mother-in-law suddenly realized that to keep her promise she has to hang herself. What did the man tell her? Five pirates stole a treasure – exactly hundred gold coins. The oldest one suggests how he would split up the loot. If he gets more than half votes they split the loot according to his proposal. If he doesn’t the others kill him and the process starts all over again – without the dead pirate. All pirates are very used to this way of dividing and they never break the rules. Everyone’s top priority is his life. Second is money. And if there is no money or life involved in his decision he likes to harm the others. How will they split the loot? There are three Chinese guys sleeping in a hotel room. Someone paints their faces with black color during the night. When they wake up in the morning they look at each other and all start laughing. If one of them realizes he is black too he stops laughing. Because they are all smart and they know it about each other one of them will realize it soon. How did he find out? Just realize that if two friends are dirty it means that I am too. If I see two laughing dirty guys it doesn’t mean that I’m dirty too they might be laughing at each other and I might be clean. Chinese didn’t point or say anything. You are sentenced at court.